There are a number of actions that impact the amount of memory VoltDB uses during operation. Obviously, the more data that is stored within the partition (including all tables, indexes, and views), the more memory is required for persistent storage. Similarly for snapshotting and export, when these functions are enabled, they require some amount of semi-persistent storage. However, under normal conditions, the memory requirements for snapshotting and export should be relatively consistent over time. Temporary storage, on the other hand, fluctuates depending on the workload and type of transactions being executed. If the client applications are "firehosing" (sending stored procedure requests faster than the servers can process them), the temporary storage required for pending procedure invocations will grow. Similarly, if the parameters being submitted to the procedures or the data being returned is large in size (up to 50 megabytes per procedure), the buffer for return values can grow significantly. The nature of the workload also has an impact on the amount of semi-persistent storage. Read-only queries do not require space in the undo buffer. However, complex queries and queries that return large data sets require space for temporary tables. On the other hand, update and delete queries can take up significant space in the undo buffer, especially when a single transaction (or stored procedure) performs multiple queries, each requiring undo support. The use of the temporary and semi-persistent storage explains fluctuations that can be seen in overall memory utilization of servers running VoltDB. Although delete operations do eventually release memory used by the persistent storage, they initially require more memory in the undo buffer and for any temporary table operations. Once the entire transaction is complete and committed, the space in persistent storage and undo buffer is freed up. Note, however, that the unused space may not immediately be visible in the system RSS reports. The amount of memory in use and the amount of memory allocated can vary as a result of the interaction of several different memory management schemes that all come into play. When VoltDB frees up space in persistent storage, it does not immediately return that memory to the operating system. Instead, it keeps track of unused space, which is then reused the next time a tuple is stored. Over time, memory can become fragmented. If the fragmentation reaches a preset level, the memory is compacted and unused space is deallocated and returned to the operating system. Figure 9.2, “Details of Memory Usage During and After an SQL Statement” illustrates how a delete operation can have a delayed effect on overall memory allocation. At the beginning of the transaction, the deleted tuples are recorded in the semi-persistent undo buffer, increasing memory usage. Any freed persistent storage is returned to the VoltDB list of free space. At the end of the transaction, the undo buffer is freed. However, the storage for the deleted tuples in persistent storage is managed and may not be released immediately. At some point, VoltDB compacts any fragmented memory and releases unused blocks to the system. How and when memory is actually deallocated depends on what that memory is being used for and how it is managed. 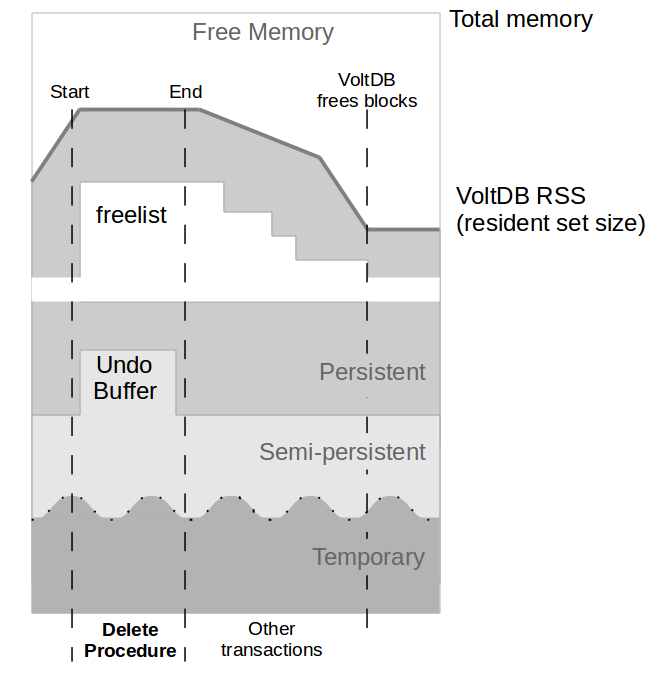 The following section Section 9.3, “How VoltDB Manages Memory” describes how VoltDB manages memory in more detail. Finally, there are some combinations of factors that can aggravate the fluctuations in memory usage. The memory required for snapshotting is usually not significant. However, if non-blocking snapshots are intermixed with update-heavy transactions, the snapshot copy-on-write buffer can grow rapidly. Similarly, the memory used for export can grow if export is enabled but the connector cannot reach the target destination to clear the export buffer. However, the export buffer size is constrained; after a certain point any additional export data that is not acknowledged by the connector is written out as export overflow to disk. So memory used for export queues does not grow indefinitely.